it is just a 5-minute walk. Walk out of the main entrance of the station and go straight ahead on the Damrak for about 250m. Take the first street after the water to the left (Oudebrugsteeg) towards Grasshopper. 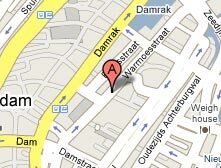 Go straight ahead until Warmoesstraat and turn right. We are at number 129 on your left-hand side. Take a train directly from the airport to Amsterdam Central Station. Buy a ticket from a machine or at the desk (more expensive). This train ride will cost around �3,80 (one-way ticket) and takes about 12 minutes. Bus 401 leaves in front of the airport every 10 minutes to Eindhoven Central Station. You can buy a ticket on the bus (�2.60) and the bus ride takes 20 minutes. From Eindhoven Central Station a train to Amsterdam Central Station leaves every half hour (:32 and :02 ) from platform 5. A one-way ticket will cost �17.70 and takes about 1,5 hour. Bus 33 leaves in front of the airport every 15 minutes. You can buy a ticket on the bus (�2.60) and the bus ride takes 20 minutes. From Rotterdam Central Station a train leaves for Amsterdam every 15 minutes. A one-way train ticket from Rotterdam to Amsterdam will cost �13.50 and takes one hour. Your bus (eurolines etc) will terminate at Amsterdam Amstel train station. Just walk into the train station and take one of the trains to Amsterdam Central Station, leaving every 8 minutes. A one-way ride will cost �2,20 and takes 10 minutes. Most major airlines fly directly to Amsterdam. For cheap flights within the UK and Europe try www.ryanair.com or www.easyjet.com. Both have several flights a day connecting Amsterdam to other major centres at very affordable prices. Book far enough in advance and travel for �0.01 each way (plus taxes and fees). Eurolines still remain the best option for cheap, intercity travel between Amsterdam and most other European destinations, large and small. Visit www.eurolines.com for prices and schedules. You can also hitch a ride on the EuroStar at www.eurostar.com. This is a super fast and carbon neutral way to cross the English Channel, and the train connects to most major travel hubs. From London, take the Eurostar to Brussels and a change here to continue on to Amsterdam. Book early for cheap seats and enjoy discount youth prices until the age of 26.